Has anyone heard of ‘Laughter Yoga’?? Sakura House was filled with lots of laughs yesterday!! We had a special guest from Japan. 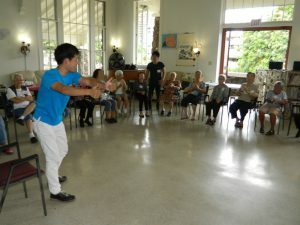 Mr. Okubo who is a master trainer of Laughter Yoga came to Sakura House for our seniors. Laughter yoga is a practice involving prolonged voluntary laughter and it does promote the use of breathing activities in-between laughter exercises as a way to relax the body and mind. It is based on the belief that voluntary laughter provides the same physiological and psychological benefits as spontaneous laughter. We really experienced that effect through this wonderful activity!! but once Mr. Okubo practiced laughter yoga with some techniques, everyone changed to real laughter!! 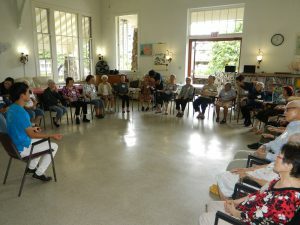 Some of our seniors had been laughing all the time during the activity and everyone was able to relax through Laughter Yoga. They really had fun and spent the rest of the day with relaxing mood. 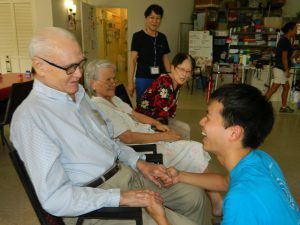 In Japan, many care workers take a lecture for Laughter Yoga and they practice it in their own facilities. Through Laughter Yoga, we realized again how laughing is important for our mind and body. 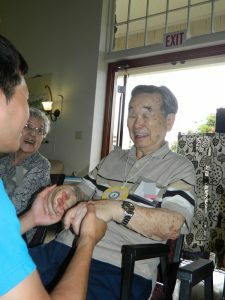 We keep our motto ‘Bringing smiles to everyone ‘ in mind, and we always try to make more laughs at Sakura House.